Technology has become the pulse of any organization. Being the largest independent insurance agency in Michigan, we need our electronic pulse to be strong, steady, and reliable without ever missing a beat. GRIT Technologies has delivered that kind of service to VTC, keeping us on the cutting edge in an ever evolving electronic world. From maintenance of management software to communications and everything in between, GRIT is the partner we trust. GRIT has been wonderful in taking care of all of our IT needs. They understand the nature of small business and the importance of keeping workflow going. The service center is attentive and they often solve issues remotely within minutes. However, when needed they come onsite and have been fantastic at solving issues that arise. They have a thorough system to track tickets and ensure IT problems are addressed and solved. 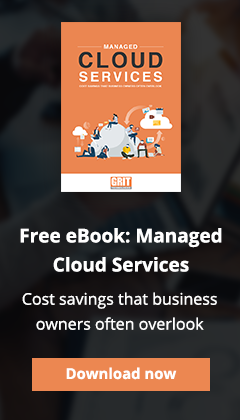 I'd recommend GRIT to any business who wants good service with technical expertise. Over time, we learned the hard way that you get what you pay for. When it got to be too much to handle internally, we hired a college student. That was cost effective until he crashed our server and lost the data backups. The company we brought in to rescue us from the disaster became our new provider but they would only fix what broke. When we learned of GRIT Technologies proactive approach to monitoring and preventive maintenance, we had found the best of all worlds. It’s like having large-company IT staff resources for less cost than doing it in-house. GRIT takes care of our notebooks without wiping out our checkbooks. We are extremely satisfied with the IT service that we continue to receive from GRIT. Their staff is knowledgeable, friendly and respond to issues in a timely manner. Although we are a small company, our IT infrastructure is extremely important to us. It's nice to know that we have a company that we can rely on to ensure our systems run smoothly and are protected. Since 2011, GRIT Technologies has been our trusted IT partner. We went from having an IT person on our payroll to outsourcing our technology needs to GRIT and couldn’t be happier with the results. They’ve grown along with us, supporting our technology every step of the way. They’ve allowed us to focus on what we do best, knowing our systems are in good hands. Highly recommended! "We are so pleased with the GRIT team! The thing I appreciate the most (vs our previous IT company) is how proactive they are. They have really helped with the stability of our IT system and since we have been clients we have experienced relatively no down time. Techs are always available and responsive to our team for urgent issues. If they cannot immediately correct an issue, they dig into it and get us timely answers and resolutions. Across the board, their staff are very friendly and knowledgeable. GRIT has always been more than fair with pricing and we have never had “hidden costs” or surprises with our billing. I have already recommended them to business contacts and will continue to do so!" GRIT has made a huge impact on Macomb County Habitat for Humanity. Their technical support is amazing in so many ways. First, they respond quickly to any/all issues; their prices are reasonable; and the ease with which they troubleshoot and “fix” issues is noteworthy. With an extremely knowledgeable staff, they resolve our technical issues and allow us to do what we do best: provide community, hope, and homes to those in need. I give GRIT my highest approval rating and would encourage all for-profit and non-profit organizations to hire them for increased productivity and data security. I just wanted to write and let you know how great it is to have your company provide technical support for our computers. You and your employees are extremely friendly, helpful and knowledgeable. Your response time to any of my computer problems is excellent. Even though I am a small business, you treat me as if I was a major company. I fully recommend your company. It gives us great pleasure to recommend GRIT Technologies (the greatest IT Techs around). Over the past year they have went above and beyond. Their customer service is top-notch and we’ve been very pleased with the work they’ve done for us. I am very pleased with the personal attention and expertise of GRIT Technologies. Not only does my experience with GRIT surpass all IT companies we have previously used, their positive and congenial attitude makes them a pleasure to deal with. Everyone we have dealt with at GRIT Technologies has been professional, personable and very willing to help. They all have a sense of urgency when we experience any problems. In fact, they usually are already aware of the problem and have it fixed or a solution in place before we even know there is a problem. Also, having a representative come out to our facility once a week to insure things are running smoothly has given employees here the piece of mind that even minor issues can be resolved at a moments notice. I would recommend GRIT Technologies to anyone that is looking for top quality IT support. As a professional services firm, Sigma understands the value and importance of focusing on core competencies and client servicing. Having a company like GRIT Technologies to serve as our IT department has given us access to a team of experienced professionals that are both knowledgeable and dependable. Recently, Sigma relocated to a new office building. The GRIT team was truly an asset to us throughout the entire move process; from the planning phase through the physical relocation, they were with us every step of the way helping to ensure that we had the proper IT infrastructure to support our operations. I especially appreciate the fact that on the day of our move, they were onsite with us helping to troubleshoot computer, internet and telecommunications issues. Their presence, attention to detail and willingness to go the extra mile makes working with GRIT Technologies a great experience. “Finally we have found an IT firm that is both competent and trustworthy. Our company has gone through about a half a dozen IT firms in the last ten years or so. We are far from IT experts and we need reliable IT support as our business depends on it. Other firms were either downright incompetent, were looking out for their bottom line at the expense of ours, or both. We definitely depend on Grit Technologies and, in all the years as a customer, they have not let us down. They have earned our trust by demonstrating over and over again that they have our best interests in mind. We have never felt we have paid for products or services that we did not require. They speak our language without all the techie jargon. They genuinely want us to be happy. We truly think of Grit as a partner in our firm.